This is very easy and the crackling turned out the best of anytime you've ever roasted pork. The skin is fantastically crunchy and stays so for hours. The meat is juicy and flavorful too. The pork slices cleanly. This is just such an easy and almost fool-proof recipe too. 1. Cook the pork belly in boiling water for 5 minutes then take it out. 2. Boil the seasoning mix and put in the pork belly, cook for 45 minutes then take out and drain. 3. Using a needle, poke a lot of holes in the pork skin. 4. Wrap the pork belly with aluminum foil and place it in a baking tray. Leave the side with the pork skin unwrapped and facing the top. Coat the skin with a thick layer of coarse salt. 5. 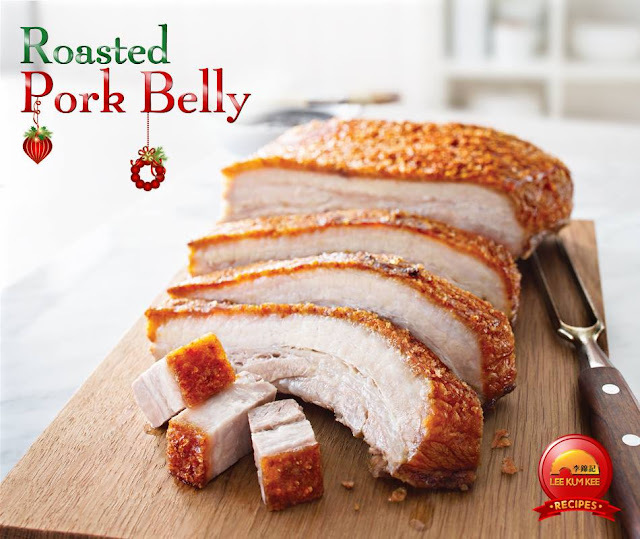 Bake the pork belly in a preheated oven in the highest temperature with top heater only for about 25 minutes. Discard the salt on the pork skin. 6. Roast again until the pork skin starts crackling and turns crispy and golden yellow. The whole process should take around 40 minutes.